Everything is seen from a different perspective after witnessing this film. There is not one thing on this planet that matters more than LOVE. That is why the bulk of the 10 commandments can be summed up in the two that Jesus spoke of. LOVE God, and LOVE each other. If these were done, nothing such as this ever need be… but it has been. And… do you think that it won’t happen again? Our society today is 10X beyond what society was like in the 1930’s-1940’s, in terms of the hatred and violence we see in every day life. The brutality we see through “entertainment” on t.v. and in movie theaters alone wouldn’t have been imaginable back then. Yet, in a world where the “vulgarity” of Elvis Presley hadn’t even been dealt with yet, something like this was happening under everyone’s nose. History is known and proven to repeat itself, despite the lessons we could learn through past horrors. So, if the things our children watch on late night T.V. can’t compare to this, be assured that the events to take place… will be unimaginable. With a strong faith, and a firm personal relationship with the Lord, one need not fear. The deaths of these men, women, and children will be justly dealt with in the judgement. So, I’ve decided to share the dessert recipe I used for Thanksgiving this year! I will probably make it again for Christmas! AWESOME Vegan Pie. Cut open the avocados and empty their contents into a food processor. Measure out all of the other ingredients and add them into the food processor as well. Run the food processor until the ingredients are all smooth and creamy. No worries about over-mixing… it’s best to be sure there are no avocado chunks left over. 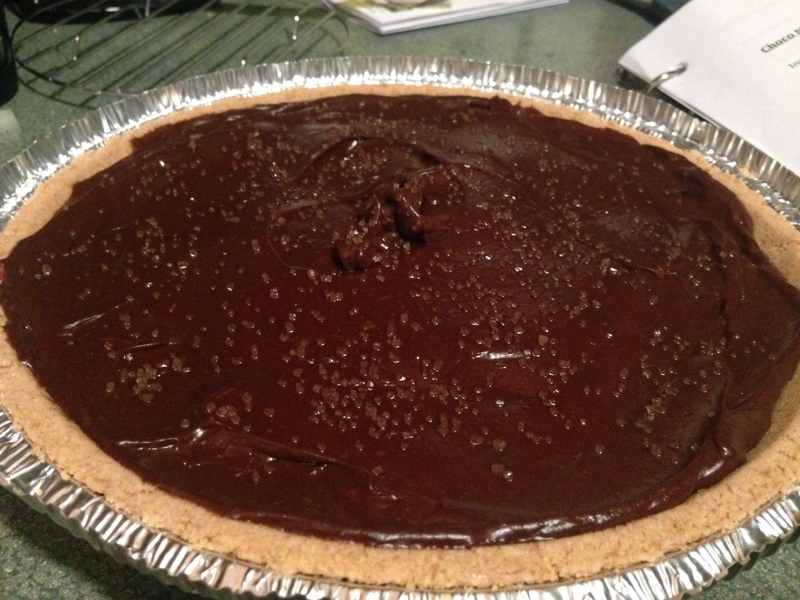 Dump the dark brown creamy filling into your prepared pie crust, and sprinkle a little of the Turbinado or Succinate on top to give it a “sparkly” decorated appearance! Once it is cooled and hardened enough to be cut into individual slices…. serve up and enjoy! The holidays aren’t over quite yet! Most people consider “stuffing” or “dressing” to be only a Thanksgiving dish. I disagree. I LOVE stuffing randomly throughout the year… but Christmas is another time I serve it to friends and family! I’ve taken an old family recipe (one most of us have used throughout our lives) and have changed it to adapt to my new Plant-Based lifestyle! I made it for our company Thanksgiving dinner and everyone really liked it… so I figured I’d share it with the rest of you as well! Hope you enjoy! Let a few Tbsp of your “butter” melt in a large frying pan on low heat. Cut up your celery and onion, toss them together into a frying pan on medium low or medium heat. Cover with a lid, checking on them and letting them cook until they are well cooked. While the celery and onion is one the stove, cut up your olives and water chestnuts (and possibly mushrooms) to the size desired. Pour your boxes of Vegetable Stock as evenly as possible over your stuffing mix. Making sure it is plenty moist. At this time you may also pour in your poultry seasoning and water mix. Add the olives, water chestnuts, cooked celery and onion, and mix well! One of the breakfast foods that people miss the most when switching over to a plant based lifestyle is biscuits and gravy! Well, here is a vegan/plant-based/whole foods option that is quite tasty indeed! Blend ingredients (except the sausage) until very smooth. This takes approximately 4 minutes or so in the average home blender. Break up and brown the Gimme Lean sausage in a large saucepan. Add gravy mixture to saucepan and bring to a boil, stirring constantly until thick. Pour your tasty gravy over your perfect little biscuits, and enjoy!!! Ever wanted to see someone’s “story” as a picture book? Well, this is one “picture book” you won’t forget soon. IT BEGINS . . . . He is a hero… She is his angel. God has blessed us all, for he has put Marines, Sailors, Airmen and Soldiers here to protect what we believe in! Please pass this on. Also, pray for our men and women who have served and are currently serving our country. Pray for those families of heroes who have given the ultimate sacrifice for freedom. Awesome… can’t wait to see the next ones! Vegetarian/Vegan/Plant-Based? What is the difference?! For many people out there, the question of Vegetarian vs. Vegan can be quite confusing. Then you throw in “plant-based” dieters and now there is a whole NEW avenue of thought. If we were really to be honest, we could even state that there are MANY people out there that give themselves the title of “vegetarian”, “vegan” or otherwise, and really aren’t quite sure of the distinction themselves! Well, we are here to explain it to you. Hopefully we will be lifting the cloud of confusion rather than adding more to the tangled mess! There are actually a few different facets of “vegetarian” out there. As a matter of fact, the title of “vegetarian” (if properly understood) could encompass each and every one of the different diet styles once you step out of total carnivore. First, you have the Semi-vegetarian: This has a few different classes in it’s own. But, it is someone who’s cutting back on their intake of meat, in general. A pollo vegetarian avoids red meat and fish but eats chicken. A pesco pollo vegetarian avoids red meat but eats chicken and fish. Secondly, there is the Lacto ovo vegetarian: A lacto ovo vegetarian diet excludes meat, fish, and poultry but includes dairy products and eggs. Most vegetarians in the U.S., Canada, and Western Europe fall into this category. Lacto ovo vegetarians eat such foods as cheese, ice cream, yogurt, milk, and eggs, as well as foods made with these ingredients. Third up is the Lacto vegetarian: As you can guess… lacto vegetarian diet excludes meat, fish, and poultry, as well as eggs and any foods containing eggs. A lacto vegetarian would, however, eat dairy products such as milk, yogurt, and cheese. Fourth & lastly we have the Total vegetarian: This refers to someone who avoids the consumption of all animal products (meat, fish, poultry, eggs, and dairy products.) The goal is to eat vegetables, fruits, nuts, legumes and grains as grown. Avoiding GMO and other chemically altered foods. Often this can involve the exclusion of such things as high-fructos corn syrup, refined sugars, and oils that are high in saturated fat. This can ALSO be described as a “Whole Foods/Plant-Based” diet. Now, at this point people can easily get confused. Most would describe the Total Vegetarian/Whole Foods/Plant-Based kind of diet as vegan. But in fact, vegan is something entirely different! Now we have Vegan: Technically, the term vegan refers to more than just the diet alone. A vegan is a vegetarian who avoids eating or using all animal products, including meat, fish, poultry, eggs, dairy products, any foods containing by-products of these ingredients, wool, silk, leather, and any nonfood items made with animal byproducts. Some vegans also avoid honey. Honestly, “veganism” is not just a diet… it is a belief and a lifestyle. While personal health is a large understanding of this belief system, it is generally (as far as media and outreach go) more focused on animal rights, abolishing animal cruelty, boycotting such industries as the zoo, circus, animal testing facilities etc. Indeed, being a Total Vegetarian (or following a Whole-Foods/Plant-Based diet) is also a lifestyle and a belief. The belief is that our bodies are comparable to a 1967 Chevelle (or insert your favorite muscle/sports car here!). If you had such a beautiful machine… how would you take care of it? You’d wash it regularly with the softest soap, dry it with a micro-fiber cloth, buff and wax it with the utmost care… right? How about when you drove it? Would you take it off-roading through a valley of sharp rocks and clay dirt at 85 mph? I should say not! These little gems are driven carefully on open, well maintained roads. Taken to an from car shows, and used to cruise on the occasional weekend get away. Then they are stored carefully in the garage, our of the rusting spring rains, harsh summer sunlight, debilitating autumn frosts & blistering winter winds. (Alright… can anyone tell I like hot rods? Ok… moving on.) How about the ENGINE? It’s all well and good to make sure your baby is shiny, rust free, cherried out and smells like brand new leather, right? Of course! Now you are going to go pay as little as you can for some cheap regular fuel, and carefully mix it with some random, tobacco stained sand from the local junk yard. The oil will be regularly changed of course, refreshed with just the right 50/50 mix of cheap SuperTech and cat urine. As far as the wiper fluid goes… we don’t worry much about that, just throw in some old dish water, it’ll be alright. Exactly… this makes NO SENSE. Why have a beautiful rig, that doesn’t run because the engine is shot! It’s so packed full of sludge and who knows what else that there is no way it will make it past your neighborhood stop sign! Most people don’t realize, THIS IS EXACTLY WHAT WE DO TO OUR BODIES!!! We are SO concerned with what is on the outside, yet we neglect the internal components that keep us running! So that’s great! You look like Audrey Hepburn on the outside, but then it’s time to go out and grab a greasy cheese burger at some local fast food restaurant. Get the extra large fries that are wilted down with oil and salt. Don’t forget the “diet” coke full of sugar, aspartame, caffein, and other horrible things. Oh but wait! I had a salad for dinner… so I’m all right. It’s all about balance, yeah? No. The salad most likely something bought off of a grocery store shelf. Prepackaged, preserved with who knows what to keep it from wilting… it had slices of grilled chicken, tons of ranch dressing (or a sodium riddled italian alternative), sprinkled with goat cheese and whatnot. Now, are we saying that a salad such as described above is going to kill you? Wouldn’t you rather be beautiful on the outside, BECAUSE you are healthy on the inside? It isn’t THAT crazy of a thought is it? If you are looking at the comparative of your AMAZINGLY created body…. and a beautiful 67 Chevelle, you know what I mean. The engine of a car is by FAR more important then the outside appearance, especially if you just want to use your 10 yr old Toyota to get from point A to point B. Just because it is YOUR vehicle, youat LEAST maintain it to a point of being able to run! So much MORE so in the case of a muscle car that you are trying to keep in TIP TOP CONDITION. If you want your body to be in tip top condition… fuel it like it MATTERS. Have questions on WHY a Whole Foods/Plant-Based diet is the best maintenance for your awesome engine? Wondering why we say animal products and processed/refined foods are like sand in your gas tank? Well… tune in for our next post. You may be surprised yet!